Today, Monday May 18 at the “Fondazione Triennale di Milano”, within the third edition of the”Medaglia D’Oro all’Architettura Italiana”, the Medaglia d’Oro all’Opera was awarded at Massimiliano and Doriana Fuksas for the project Zenith Music Hall of Strasbourg. Fuksas architects have also received the Menzione d’Onore – Spazi e Infrastrutture pubbliche, for the project San Paolo Parish Complex of Foligno. Oggi lunedì 18 maggio presso la Fondazione Triennale di Milano, nell’ambito della terza edizione della “Medaglia D’Oro all’Architettura Italiana”, la Medaglia d’Oro all’Opera è stata assegnata a Massimiliano e Doriana Fuksas per il progetto Zenith Music Hall di Strasburgo.Gli architetti Fuksas hanno inoltre ricevuto la Menzione d’Onore – Spazi e Infrastrutture Pubbliche,per il progetto Complesso Parrocchiale S Paolo di Foligno. By its playful form and character, the Zenith music hall contributes to the great Varietee Theaters which were built since the Zenith building in Paris was erected in 1984. 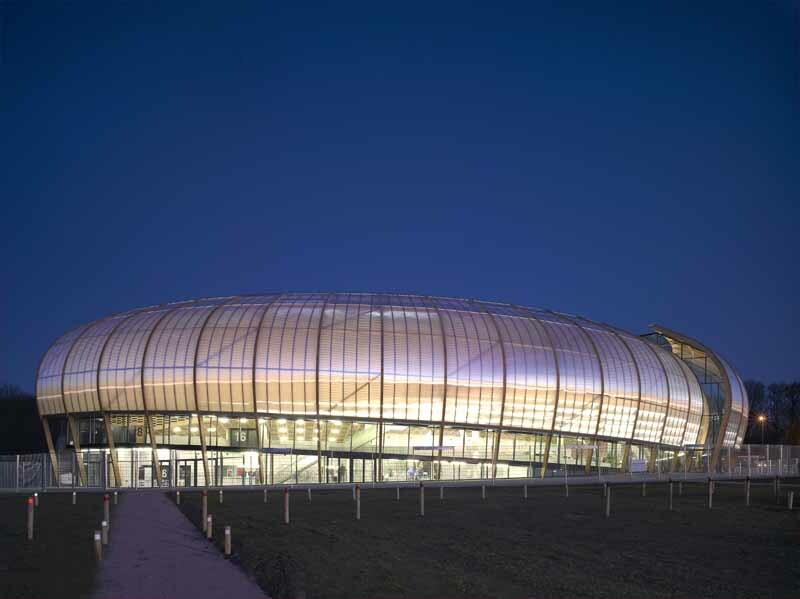 The new Zenith building is an important project for the exhibition area in Strasbourg. It will be the new attraction which will give new impulse to the future development of the city’s infrastructure. The concept of the design is based on a modular and a well balanced organization of the different elements: good views for all spectators, best acoustics and an optimized cost management already addressed during the concept phase of the design. The Zenith music hall provides ideal facilities for the guests and the artist performing. The building is to be understood as a single, unifying and autonomous sculpture. By layering and rotating the ellipsoid metal façade structure, the design receives a very dynamic character. This is underlined with the translucent textile membrane, which covers the steel-frame and creates magnificent light effects. These orange membranes also cover the volume of the music hall itself. This is the heart of the building: a totally enclosed and protected space, which creates a special theatre atmosphere. Projections on the outer skin create playful effects and convert the façade into a huge billboard communicating with the passers-by for upcoming events. While the buildings appearance exposed to daylight is of a monolithically calmness that mutates at dawn. The inner experience is transmitted to the outside thought out the transparent skin: the whole building becomes a “light sculpture”.